For history buffs, “The Shot Heard ‘Round the World” refers to one of two significant dates. For American History buffs and American English majors, the distinction refers to a phrase from Ralph Waldo Emerson’s “Concord Hymn.” When Emerson was writing the Concord Hymn in 1837, he lived in an old family house thirty yards away from North Bridge in Concord, Massachusetts, where American patriots are reputed to have first fired their rifles at British soldiers in organized resistance on April 19, 1775. 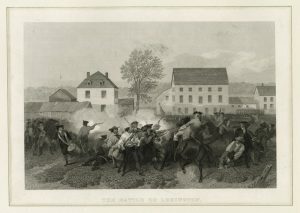 On the other hand, those in Lexington, Massachusetts will point out that before the American Minutemen defeated that British force at Concord, shots had already been fired at Lexington. 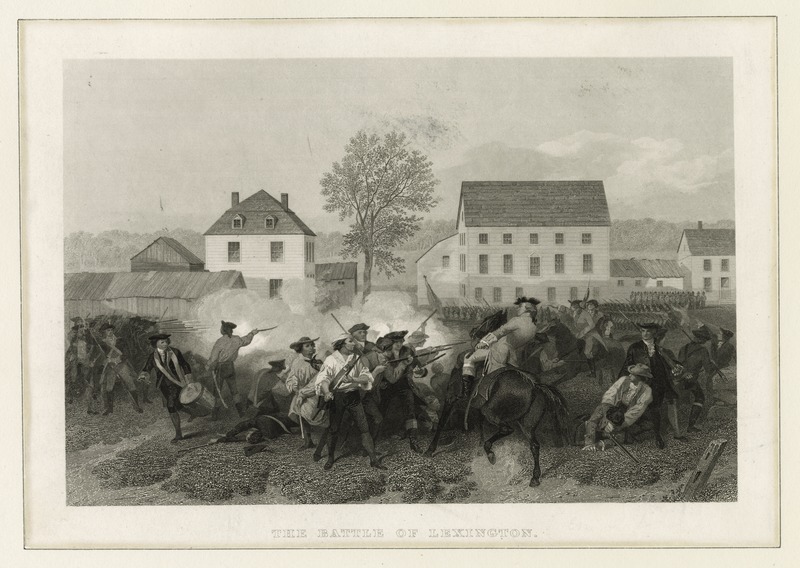 Concord proponents claim that the Lexington skirmish was not an organized battle conducted by militia, but rather an impromptu act of resistance that led to the slaughter of the Americans. Emerson might not have been thorough enough in his research for the tastes of the folks in Lexington but his point was valid. It’s fair to say that all the shots fired in Massachusetts on April 19, 1775 were indeed noticed around the world. For most Europeans, “The Shot Heard ‘Round the World” refers to the June 28, 1914 assassination of Austrian Archduke Ferdinand in Sarajevo. 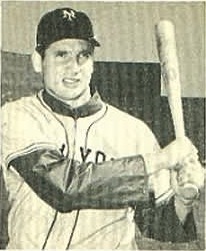 For fans of the New York Giants baseball team, “The Shot Heard ‘Round the World” refers to a Home Run hit by New York Giants third baseman/outfielder Bobby Thomson on October 3, 1951. In early August of that year, the Brooklyn Dodgers had a commanding 13 ½ game lead over the Giants, and the pennant race appeared to be no race at all. Then the Giants surged, and the Dodgers faltered. They ended the season tied for the National League Pennant. Which of the three aforementioned events deserves to be remembered as “The Shot Heard ‘Round the World” is a matter of personal perspective. Perhaps it’s fair to say that two shots were heard ‘round the world, and one was heard ‘round the baseball world. 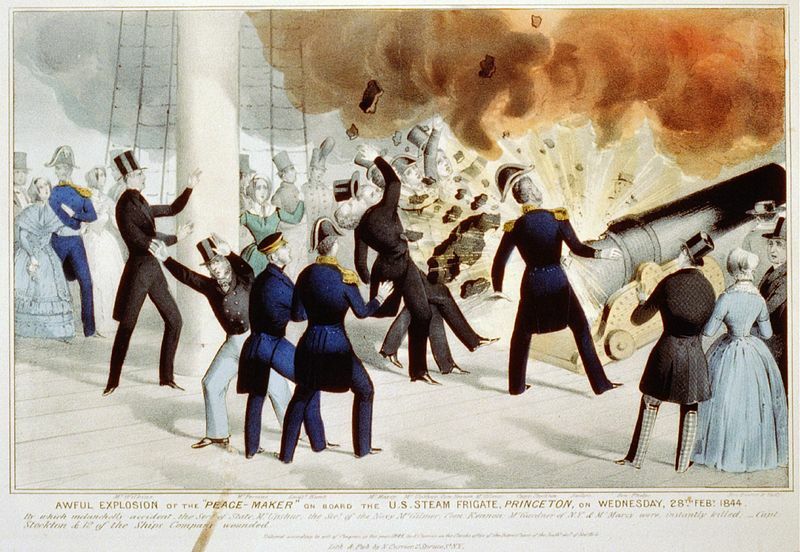 On February 28, 1844 another important shot was fired. While it was not “Heard ‘Round the World,” it was heard by several hundred notable American politicians and dignitaries, and it led to a marriage bed. The USS Princeton had been launched on September 5, 1843. Like every expensive Naval vessel both then and now, it was presented as a “state-of-the-art” warship. The USS Princeton created quite a stir in the USA because it was the first ship to use a screw propeller propulsion system, and it was considered to be the best-armed ship in the US Navy. Along with a variety of smaller guns, the Princeton carried two long-barreled cannons named the “Oregon” and the “Peacemaker.” The Peacemaker’s twelve-inch bore made it the largest naval gun yet created. The USS Princeton sailed to Alexandria, Virginia in 1844 for a publicity visit. Its visit was the social event of the year for politicians and the American social set. On February 28, US President John Tyler was the guest of honor at a party onboard, along with US Secretary of the Navy Thomas Gilmer and US Secretary of State Abel Upshur. One of President Tyler’s guests was his close friend David Gardiner and Gardiner’s two daughters. The fifty-four year old President was a widower and had set his eye on twenty-four year old daughter Julia. Julia had thus far declined President Tyler’s advances. Based on Tyler’s portraits, even on his best days, he was as ugly as a mud fence. Against that, he had power, wealth, and prestige going for him. Julia Gardiner remained unimpressed. In the excitement of the moment, US Navy Secretary Thomas asked the Princeton’s Captain Robert Stockton to fire salutes from the massive Peacemaker. Stockton agreed and had two shots fired. The roar of the Peacemaker appropriately awed the crowd, and most of them returned below decks for more free food and booze. As the toasts continued below, Navy Secretary Gilmer grew prouder and more emotional about the marvelous Princeton and her massive Peacemaker gun. Gilmer asked Captain Stockton to please fire another salute. Captain Stockton thought that it was unwise to risk more shots with a crowd of civilians on board since the Peacemaker had not yet undergone proper testing. Why Stockton was reluctant to fire a third shot is a bit of a mystery. However, with President Tyler’s coaxing and Secretary Gilmer’s insistence Captain Stockton finally ordered that another salute should be fired. Toasting guests delayed President Tyler below decks. When he began climbing the ladder* to the main deck, the Peacemaker fired a third time. The cannon exploded. 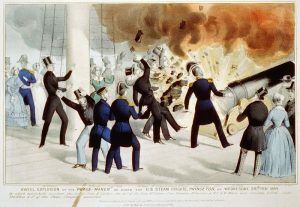 Six people on the main deck, including the Secretary of the Navy, the Secretary of State, and the President’s friend David Gardiner, were killed. When Julia arrived on the main deck with the President’s entourage, she saw her dead father and fainted. President Tyler whisked her away in his carriage. The incident apparently affected Julia to such a degree that she then saw President Tyler in a new light. She agreed to marry him. Hence, “The Shot Heard ‘Round the Bedroom.” Fortunately for all concerned, any details about their honeymoon remain mercifully mysterious. Tyler lived happily with Julia until his death, eighteen years later. Julia survived him and died in 1889 at the age of 69. They remain forever together at Hollywood Cemetery in Richmond, Virginia. Not earth-shaking like so many of your posts, but still interesting. Thanks, Jay. I enjoy the diversity of your posts, Holmes. In particular, I admire the history you always provide. For me, some of it is review while other times, it is new. Regardless, I read for a balanced perspective on events new and old. In that regard, Bayard & Holmes is unique. Thank you both. Hi Karen. Thank you for your generous assessment.